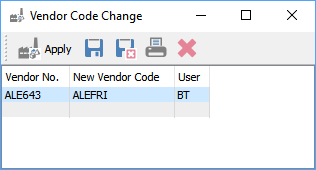 Vendor code change allows the user to change the vendor’s code and once applied it changes the code in all of the tables where that vendor was previously posted. Once applied it will be as if that vendors code always had the new code. No history of the old code is kept. This utility is accessed from the top menu under Vendors/Vendor Code Change and requires the User setting Vendors/Vendor Customer Code. *NOTE:- That posting the changes requires exclusive use of Spire, however adding to the list does not.